FAIEZ MUSTAFA SERRAJ, President of Libya, said his country was still facing “very trying times”. The period following the 2011 revolution had been marred by war, and democracy and the rule of law could not be enshrined without cooperation. Thanking all countries and organizations that had assisted in stabilizing the country, he described the Libyan Political Agreement as the cornerstone on which stronger State institutions could be built. Libya was undergoing the transition needed to achieve stability and leave the past behind, with the Presidency Council at the root of that effort, he said. Libya’s aim was to achieve truly inclusive national reconciliation, he continued, adding that the effort had been slowed by the unwillingness of certain parties to work towards consensus. Violence had ended in Tripoli and other cities across Libya, and embassies were set to reopen, he said, adding that the United Nations Support Mission in Libya (UNSMIL) was planning to return. Those displaced by war were now able to return to certain parts of the country, but efforts were still needed to restore peace and security. Noting that the economy had been bolstered by a tenfold increase in oil production, he urged the unfreezing of Libyan assets, saying the lack of access to those funds cost the country $1 billion a year and hurt prospects for stability. The path to political stability included presidential elections to be held in 2018, he said, emphasizing that the war against terrorism in the country must continue. He called for the development of military and law-enforcement capabilities, noting that cities freed from Da’esh/ISIL were still reeling from the effects of occupation. 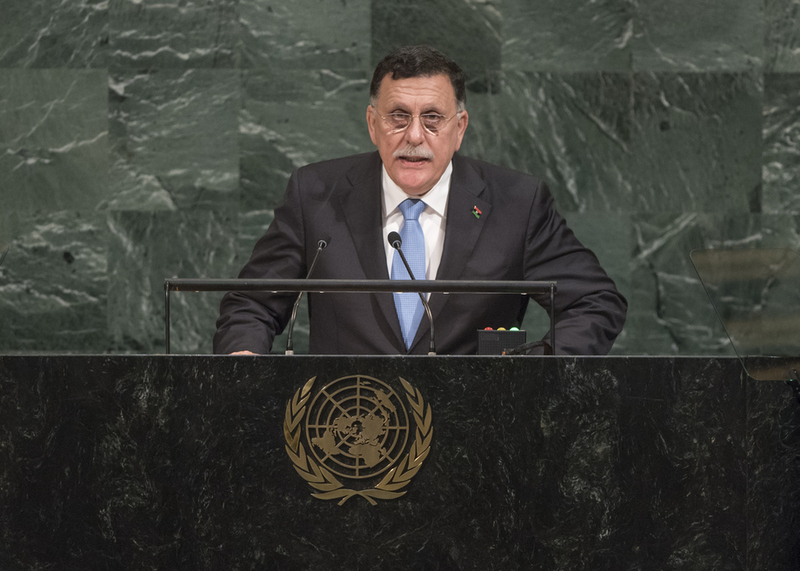 Describing migration as a major burden for Libya as a transit country for migrants headed to Europe, he called for greater assistance to address the refugee crisis, and noted that the country was in need of more shelters. The migration crisis exacerbated the scourge of arms smuggling across Libya, he noted, thanking Italy, France and Germany for helping to secure the country’s southern border. Libya was providing all possible assistance to migrants, he said, insisting that the best approach was returning them to their countries of origin. He went on to underline that the situation in the Middle East remained an absolute priority, stating that Libya would “spare no effort” to support the Palestinian people and the push for the Arab Peace Initiative to resolve the Palestinian question. He also called for a peaceful resolution of the crisis in Syria. The solution to the crisis in Libya was political, he said, emphasizing that human rights must be “front and centre”. He called upon the Secretary‑General and his Special Envoy to present a timeline and a clear message aimed at “all who want to impede” the reconciliation process. Libya also called on the United Nations to work towards a more inclusive Security Council in which Africa would hold a permanent seat.